You may or may not have noticed that I’ve been typing articles a bit less frequently in recent weeks, and that is for good reason: I’m doing real work these days! The foreclosure project is going extremely well so far, both when measured against the original schedule and budget, and when measured on the fun-o-meter. We’ve had a few interesting design inspirations that should make for a nicer interior and exterior feel than we originally anticipated, which may lead to a higher rental income than the original budget as well. I’ve got a few interesting how-to articles in the works to document how some of these things were done, but I figured I should tell the renovation tale in chronological order, which starts with shopping for the materials needed to rebuild this run-down house. When you do a home renovation project, the materials are a huge part of the cost – both to your wallet and to the Earth. A project like this requires windows, doors, plywood, studs, tiles, concrete, lighting and plumbing fixtures, and many other things. The interesting thing about renovations, at least in the wealthy Boulder County area where I live, is that people are always doing them. Middle-income people buy 60-year-old fixer-upper homes and build them into more comfortable and energy-efficient places to live. Upper-income people often buy higher-end homes and make major changes even when the houses are quite fancy to begin with. Meanwhile, commercial buildings are always being built, torn down, and remodeled by larger companies. The result of all of this activity is a huge surplus of building materials. Extra tiles left over from someone who bought too much for his bathroom. Entire kitchen cabinet sets and high-quality windows and doors from the homes of rich people who grew tired of the current layout of their house and had it rebuilt. Even unused beams and industrial-grade components from office construction projects. And of course various fixtures and parts of every type. The limitation when buying your materials second-hand, is that you have to adapt your project to fit the materials, rather than custom-ordering the materials to fit your project. But that is pretty much a core concept of the Mustachian Way, so it is good practice for life in general. For example, the new front door was the standard 36″ wide.. but the old door was only 32″. This worked out well, because you really should have at least a 36″ door in a house anyway, in case a future resident needs to move in a large refrigerator or couch. It is also necessary to allow someone to roll a wheelchair through comfortably. So today I cut out the old door and part of the wall, and framed a new wider opening into the front of the house. It took quite a few hours of cutting, routing, nailing, and even occasional swearing, but it was VERY satisfying to hear my heavy new door click precisely into place, fully weatherstripped and insulated, as I locked up the place to go home this afternoon. And the whole house now looks better when viewed from the street! 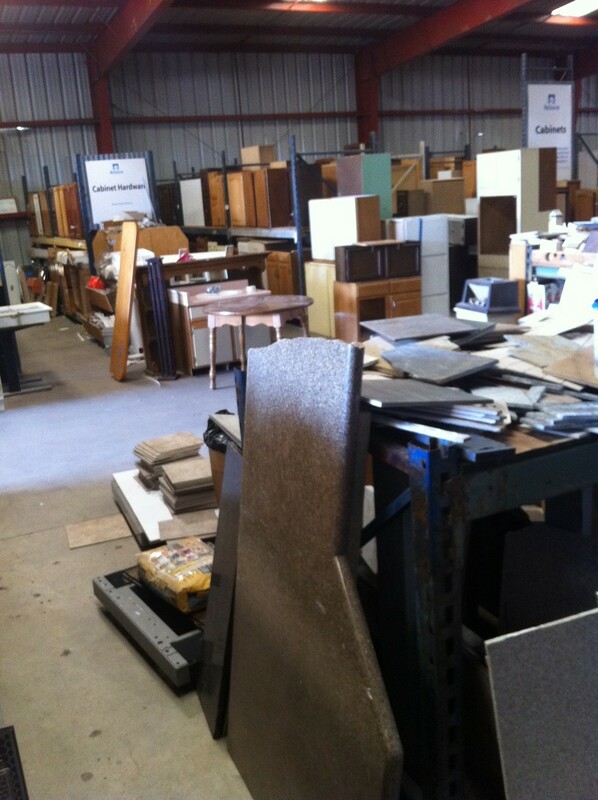 Since the recycled building materials store runs on donated items, not everything there is suitable for use in a high-quality renovation. The windows and doors are surprisingly good, as are the tiles and toilets and some of the kitchen cabinets. But the appliances, lighting, and plumbing fixtures are usually things like green or almond-colored fridges and stoves or gaudy brass faucets. For these things, you simply move on to Craigslist materials. Even after passing through these two steps, I still end up purchasing plenty of new things. Wood, nails, adhesives, shower valves, plumbing, and many other things are rarely available used. But by getting some of the most expensive things from these alternative sources, you are really “focusing on the big wins**”, and shaving thousands off of any renovation project budget. **I wonder if Ramit Sethi shops at the used building materials store? Didn’t I hear you mention at some point you live in Colorado? Stop by on a weekend for an edicational project workshop any time if you like! It would be fun to exchange helping labor for on-the-job learning. Indeed I do live in CO, probably an hour and a half from Longmont. That’s a might generous offer you’ve made and one I’ll be sure to take you up on after the holiday craziness is over. Thanks MMM! So, did you haul all that material back on your bike? Naming your minivan “the woman”! Hope your wife doesn’t feel she’s in the same league. Ha. I did a bunch of rehab on a 100 year old house. One project in particular was cutting away an old laundry/mudroom floor of dryrot/termite damage. My cobbled together fix with a mix of new and recycled wood was pretty stout, but I don’t know if it’ll last ten years or thirty. Also I got lazy/cheap and used a variety of nails to pound in a plywood floor, on which I laid tile. Hopefully, the floor won’t start squeaking. Probably should’ve splurged on a box of screws. In the master bath we laid a bunch of nice marble and put in a nice commode and sink, but got cheap on the tub, spending less than a hundred at Home Depot instead of ordering a Kohler for 4-500. I wonder if the quality x years of service will be a point of regret. The cheap tub looks okay, but feels flimsy underfoot. My advice is to consider the cost or value of labor on such permanent installs and decide if getting the right thing the first time is a better decision. But you can’t beat doing it yourself! Yeah, I agree – I always stick to top-quality materials regardless of the source, because my goal is to only renovations that are considered nice for several decades. The Construction Minivan (La Mujer Azul) is named in honor of her predecessor, El Amarillo, which was a 1984 Nissan compact pickup truck that was my work truck for the previous 5 years (and is still alive to this day, I just finally returned it to the friend who lent it to me). When I upgraded it to this powerful van, people made fun of me for looking like a Soccer Mom instead of a contractor. So I named it La Mujer. And used materials are not just for buying. Surely you sold that used copper for big $$, right? Yes, all iron will be donated to the metal recycling company and the copper will either be sold, or made into a solar hot water collector for the roof of my house later on. Where do you keep all the extra materials from your projects? I’ve been quietly reading your blog for about a month, and now I’m completely caught up. I absolutely love it. I made a few engineery comments before this point, but now that I’m not playing catchup, I thought I’d pick a more appropriate alias and start on my path towards becoming a regular heckler. Actually, I shouldn’t get your hopes up with that choice of wording – chances are I’ll mostly be asking questions and basking in all the glorious badassity. I’m at work (not the self-employed variety) and should get back to it, but count me in as one of your readers who’s especially interested in the renovation project. I just started my first out-of-school job this past June, and I currently rent, but buying a fixer-upper is increasingly in the back of my mind. If I were anywhere near you, I’d gladly come exchange sweat for knowledge, but that, sadly, is not the case. Keep it up, and I love the avatar. And know that part of the reason I biked to work today was your true cost of commuting article, which is the first post I read here, and the one that I share the most. Where/How did you acquire your carpentry/rehab skillz? I’ve would like to do some rehabbing myself at some point. Thanks! I just started doing things and learning from my own mistakes. Most of the best knowledge and experience was picked up since 2005 when I quit the real job. But I’d suggest the best thing to do for someone just starting out is pick a project to do on your own house, then get a few library books and watch a few YouTube videos on what you want to do. Feel free to ask me questions as well. A table saw would cut that aluminum edge off cleanly if you have one. Then you could use a sander to smooth it off the rest of the way. Or the whole thing could be done with a grinder with a cutoff wheel installed as a slightly more A-team-style method. You seem to have a little better luck than I have w/ the used materials store. I’ve stopped off at the Boulder ReSource a few times while in the area (dropping off recycling before we had curbside pick up), but it’s been about 7 years since I’ve been there. Back then, it was mostly beat-up and dated fixtures and appliances and dimensional lumber at a cost fairly close to new. It seems like times may have changed there (I think they moved to Arapahoe Rd to a larger location too), so maybe it’s worth revisiting this avenue… I have a constant stream of renovation projects going at my house. Interesting comment about the solar hot water heater too. I built a solar hot water heater / pressurized shower for my van this summer, so I could shower while on a 2+ week road trip to a trail running race. It worked well, but I need to redesign the collector element to maximize heat gain. This is an awesome article. I had no clue these existed. On my way there this weekend! We have a couple of those stores in Colorado Springs. One of the other nice things about them is that you can often find replacement parts for older house components (shutoff valve handles, etc), thus saving the trouble of replacing the whole component. Great post. I’m not sure I’ve ever commented before, but felt the urge today after months of reading. This is pretty cool stuff, and really inspiring. Reading this blog has really helped me to pin down my own views on finance and plans for life. Thanks MMM. Great article :) I’ve seen how well this can work first hand – my Dad is an architect, and he has gotten a complete, as new kitchen (granite tops, cupboard, the lot) for a rental house, and an automated garage door and motor for our house, for free. Got both at building sites where houses where being renovated. MMM, what is your advice on insulation? I’ve read about heat storage via heavy things, but I’m asking specifically about insulation. Why, I love insulation, of course! The next post might be MMM’s guide to destroying your winter heating bill, which will be a good time to figure out some of the cost/reward numbers on various insulation projects, as well as other tricks. For those that are both interested in solar thermal energy and willing to do engineering style calculations, a great (text)book on the subject is Solar Engineering of Thermal Processes, by Duffie and Beckman. Buying it new is a bit pricey, and finding it used can’t be easy, but I’d like to think it’d be available at most college engineering libraries. If you really want to optimize a solar setup, this book is a great place to start, though it’s definitely not light reading. It touches on photovoltaics, too, since most of the optimization and design choices are extremely similar. Wonderful to know that this concept is nationwide. I remember reading an article about one a couple years ago, which the author seemed to think was a revolutionary concept, though we have had our Urban Ore operating profitably (while paying a living wage) since 1981. They have been the destination of more stuff I get in hauling runs than any where else, primarily because they accept just about everything, from toilets to clothes – even wood, nails, adhesives, shower valves, and plumbing – most of the receivers know me by name. It doesn’t hurt my decision to go there that (unlike Goodwill or other reuse options) they pay for dropping stuff if it is valuable enough. Hi MMM – your blog has truly helped me (and my hubby) be on the same page with our financial goals. Thank you for your blog! We are thinking of renovating our kitchen with just minimal help if at all – but we want to take out a wall that divides the kitchen and dining – what is the most cost efficient way to find out if the wall is weight bearing ? I imagine you’ve figured it out by now, but it’s based on which way the ceiling joists travel. Walls parallel to the joists are not weight bearing. Those perpendicular normally are, especially toward the center of the house (ie, the ceiling joists span from the outer walls to an inside wall/beam). If there is no story above your kitchen (ie, it’s an attic), there might not be any interior load bearing walls if the roof was constructed with trusses. It would be nice to have one of those stores near me. Working in the home repair and remodeling business I was able to get much of the materials for building my own house for free. Actually it was better than free. I was paid to remove them from their original locations and haul them away. I got all my entry doors, kitchen and bathroom cabinets, some interior doors, windows and plumbing fixtures. My best freebie was a two car garage. I jacked it up and prepped it for the move, then I paid to have it moved 3/4 of a mile and placed on a new slab with radiant heat. If you know the contractors who work on expensive homes you can often get the materials as they are removed. Most of the wood for my house came from a very mustachian source, my own woodlot. I logged it, bought a used bandsaw mill and cut my own lumber. Some of that lumber became a solar heated kiln which was used to dry what went into the house. After I was done I sold the sawmill for $1,800 more than I paid. Home rehab has been one of my goals since buying my first property… but so far I’m showing a complete lack of construction sense/skills. I’m not sure how, but even after measuring three times, cutting once, all of my laminate flooring came out too long or too short. I won’t even go into the poor baseboards. Is there a better (less costly) way of learning?!? You’ll still be better off if you can get real world experience, and helping others out with their projects is a great way to do so. Maybe you have folks in your community that you could organize a regular “Meitheal” with? (Meitheal = Cool Gaelic word referring to a revolving communal work day https://en.wikipedia.org/wiki/Communal_work#Ireland). Here’s another Youtube example of a meitheal at work https://youtu.be/EyUaTMqzoDs though you could possibly get more out of a less formal arrangement such as just helping one person with one project over several days.